Before The Evil Within came out, I knew that I had to steel myself to be scared by it. But I'd also been nagged by the idea that I should be scared for it, too. As in, fearful on its behalf. It's one of those games that's so heavily freighted by genre and pedigree that expectations were massive. The Evil Within tries its best to deliver in proportion to those anticipations. And that's probably where its problems started. 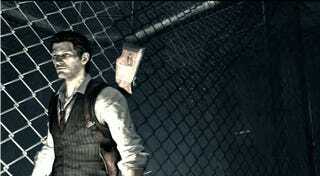 Evil Within producer Shinji Mikami made his name on the Resident Evil games. The series he once spearheaded has devolved into an action-heavy popcorn movie shootfest, a parody of itself that's barely capable of terrifying a second-grader. So, the arrival of an all-new Mikami title was anticipated as just the kind of reinvigoration that the survival horror genre needed. You can feel the load of all those hopes and dreams in The Evil Within. It's a burly example of horror game maximalism, one that tries to take all the ways you can make a game scary and boil them over into a blood-red gumbo. Hallucinations on top of hallucinations, weird phenomena, tucked-away hamlets filled with homicidal residents, helpless, child-like weirdos… if it's something that scared someone in a movie, TV or video game once, The Evil Within tries to cram it in there. It's not enough to have once-dead people get up and attack you, for example. They're also wrapped in barbed wire, stabbed dozens of times over with knives, spikes and other sharp implements left sticking out of them. And some of them will get back up yet again, even after you've unloaded a clip into them. These particular flesh-eaters need to be burnt after you've beaten them or they might try to take you down once more. So, they're not twice-dead but thrice-dead. That's just lower-rung foot-soldiers, too. Some of the boss characters will need to be snuffed four and five times before they finally stop bothering the game's lead character, police detective Sebastian 'Seb' Castellanos. That's just a small example of how the game's creators try to blow out the scale of the proceedings in The Evil Within. It's a game that feels like it's trying to hit its marks in as many ways as possible. The storytelling starts with Sebastian arriving at the scene of a mass killing at an ominous psychological treatment facility. Then, scenes shift to present-day Castellanos, now one of Beacon Mental Hospital's patients in a fuzzy dreamworld where players can save the game and upgrade his skills and weapons. Then he's there again in a malevolent, shared mindscape, slowly uncovering the mad experiments where unhinged scientists connect hapless residents to some sort of animalistic hive mind. And the gruff, alcoholic cop walks Beacon's halls on yet another interlocking plane of existence. It might or might not be the real world but the freakish monsters still dog his steps. Sebastian and his police partners are pulled into a series of nightmarish events being orchestrated by a renegade scientist named Ruvik. The story is presented as a set of slowly revealed puzzle pieces but it becomes clear that the game's big bad has been scarred by a horrific family trauma. That tortured backstory mirrors Sebastian's own troubled past, revealed through journal entries that you find throughout the game. While the ever-shifting, untrustworthy presentation adds to the general creepiness of the horror-trope skeleton, the entire narrative is so under-explained and flatly acted that none of it feels memorable. Moreover, the game never makes you connect to the people barely surviving its story. It's not that Evil Within needs to aim to be another Last of Us. But more time spent on crafting the characters would have given the game-makers another way to make players uneasy. Sebastian's personality is so blasé it doesn't feel like he—or, more importantly, the player—has anything at stake. There's no charm or idiosyncrasy to these heroes or villains. They exist to be embittered or endangered and that's it. This lack of connection makes The Evil Within feel more like the work of an old master who hasn't quite absorbed the changes that his medium has gone through. That persistent taste of reconstituted past glories—intertwined with those maximalist ambitions—run throughout The Evil Within in various ways. There's the most damnable tease at the game's beginning, where the setting of Krimson City falls apart as the main characters are speeding away from a cursed location. Ah, I thought, here's where Mikami will blow up a larger, more open-ended version of his survival horror vision. But that implementation never comes to pass. Even though the spaces in the Krimson City levels are bigger, they still fit into the same "skulk + gather resources + fight" loop that you do for most of the game. Overall, you're mainly left to pick through smaller, more cramped buildings and spaces. They're exquisitely designed and serviceable enough but nothing about them feels like a great leap forward. That's true of the gameplay overall. The tension of the game's early levels centers around the idea that one wrong move will get you insta-killed, which happens fairly often. I spent a whole lot of time crouch-walking everywhere and hiding in closets in the first three chapters, feeling underpowered and lost. But by the middle of the game, the need to be cautious melts away and The Evil Within becomes more about prosaic considerations like reflex response and resource management. This is a game trying to be at least two very different kinds of things. A moody atmosphere designed to elicit scares and design mechanics which alternately direct players to be stealthy sneaks or fast-moving precision marksmen. While it's certainly possible to deliver on both of those aims, The Evil Within doesn't have the chops to make good on its multilayered promise. I felt frustrated when playing Evil Within and I felt afraid, too. The latter was okay, a result of the game doing what it was supposed to do. The former, though, was a problem. The thing I constantly had to decide is if The Evil Within was the kind of sprawl that was worth continuing through. Let's consider the weapons Sebastian wields. There are old stand-bys like a handgun, shotgun and sniper rifle. Ammo for these is scarce but never so low that you won't be able to proceed. The frustration I talked about comes into focus with the Agony Crossbow, the game's best weapon. Its bolts have a few different special abilities, like freezing an enemy in place, exploding when they get close or stunning them with strobe flashes. While you'll find bolts for the crossbow scattered throughout the world, the player is really meant to craft his own arsenal by finding scrap parts in the environment or dismantling the various traps Seb encounters. My desire to constantly have ammunition for the crossbow meant that I'd have to wander same-looking halls in search of bolts or traps. Tying the continued usefulness of the game's best weapon to an activity loop that quickly becomes boring is a telling example of Evil Within's shortcomings. A lot of the game is a tedious slog of door-opening and object-grabbing. Even the act of picking objects feels consistently buggy. If the camera's not pointed in just the right way, the prompt to pick up a bottle of green upgrade gel won't show up. And when it's not being monotonous, the big action set-pieces are hamstrung by problems that make them annoying. You're often faced with instances where you'll somehow need to intuit something that you haven't been prepped for, like looking at the ceiling to find a switch to shoot. That kind of opaque design is certainly a creative choice but when it's stapled to imprecise mechanical execution, the best possible consequences of that choice gets stifled. In other words, don't-know-what-to-do is fine, as long as able-to-do-what-you-need still reliably happens. Aiming dead center at a dead body that you need to shoot and seeing your subsequent shots have no effect… did you miss or is something else wrong? Trying to frantically mount a ledge so mutated sea creatures don't chomp on you but the command to climb up takes a painfully slow time to execute. Too often, I felt myself stymied because enemies magically detected me despite being hidden or too-same environmental design that led to me getting lost. I replayed way too many sections over and over because of moments where, seemingly, enough technical tightening didn't take place. This state of affairs wouldn't be so regrettable if there weren't other, unabashedly excellent aspects of The Evil Within. Tango Gameworks has poured terrifying creature designs, replete with Cronenberg-style body horror, into the game. It's also bursting with great artistic details in the environment, made more effective by a slew of atmospheric effects. Excellent ambient sound design and music surrounds all of that, with sonic cues that will stay in your head long after you're done playing. Speaking of creatures, The Evil Within's fiendishly architected boss fights are some of the best I've ground through in years. One level has you haunted by a ghost-like enemy who only needs to brush his fingertips on you to execute a one-hit kill. Nothing you do will harm him; you can only run. Another features a tough-to-decipher boss fights where you're too harried to tell if you're actually damaging the trap-laying monstrosity that you're battling. Other pivotal battles have you facing down big, lumbering enemies in tight, cramped spaces that don't let you take advantage of your speedier movement. Each juke and pivot is as precious as ammo and health syringes you'll hoard. These are the moments when the game feels its most assured, doling out diverse challenges that you'll need to frantically figure out as you go. Again, thrills like those lose their edge when they're mired in inconsistent response or a story that's essentially a stack of clichés. In a game where every bullet is precious and a player's patience and mental energy areis continually taxed, these things wind up being more than minor annoyances. They become reasons to give up. I wanted to like The Evil Within a lot. It is a game that delivers on much of its survival-horror-revival promise, making me jump in terror and feel sick at the sight of an enemy's guts twitching after it's dead. But it's also a game where I felt like my time wasn't respected throughout, where my most skillful attempts at stealth and combat got tripped up by messy execution. The world-making is strong here, creepy, confined conception that constantly makes you feel like you'll never feel truly free. Ultimately, though, the problems of Evil Within make it feel like a halfway-evolved collection of design ideas from its chief creator's glory days. 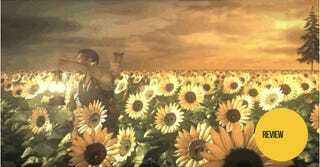 Were The Evil Within more tightly focused, that fact might be forgivable. But it's too big and diluted for its best aspects to support it.